Are you a control freak when you make art? Or does your inner child go wild? Most of us want to make art that combines structure and spontenaity, but that’s not easy! In workshops and classes at all levels, when we go around the room and talk about what we want to get out of the workshop, “I want to learn to loosen up” is probably the goal I hear expressed most often. Have ever tried to “loosen up” by just going crazy with the brush, or by pouring and spattering and splashing? Sometimes you get a wild intuitive painting that’s just great, but you’ve probably also had the experience of winding up with just a big, muddy mess! Especially if you are doing a representational painting, there’s usually a point where you wonder how you can paint loose and still have it look like something . . . and, preferably not like something painted by a three-year-old having a tantrum. Like you, I sometimes aspire to be more spontaneous in my art, but I don’t want it to look completely chaotic. My solution is to give my inner child a few boundaries and a “safe” place to play. This week, I want to share seven strategies you can use to loosen up a little in watercolor, without feeling like things are completely out of control. 1. Choose 3 colors at random and do the entire painting with only those colors. Warning: You’re going to want to cheat! I sure did when I drew the three colors I used for the example painting! Stephen Quiller’s turquoise green (a very opaque and chalky cool blue-green), cobalt violet deep (another heavy pigment), and aureolin (a cool, somewhat greyed yellow). Eeeeeuuuw! 2. Start with a wild underpainting. I slop my brush and spatter clear water around and wet the paper randomly. A little spraying here and there with a spray bottle is fun, too. Wet the paper here and there. Spraying and spattering is fun, too. I mix a light value puddle of each of my colors and then use my brush like an eyedropper to drop colors all over the paper, letting it run where the paper is wet, and puddle on the dry areas. I spatter color as well, and tip the paper to encourage the color to run. Drop in color and let it run. Let this layer dry before proceeding. Then paint as though it’s not even there. Just ignore it and let it show through here and there. It’s amazing how much interest it can add to your light areas to have these mingled colors showing through. As you get some practice with this, you’ll be able to use it to give a subtle effect of dappled shadows or interesting texture to an otherwise simple design. 3. Work wet-in-wet within shapes. I’ve wet the entire area of the bowl, the lemons and their shadows. Sometimes it’s easier to get yourself to let colors mingle and flow if the color can’t go all over the entire paper. Try wetting a specific area and then drop in color and let it mingle. Drop in color and let it mingle within the entire area. Don’t worry about the boundaries between “things”. If you’re clever about how and when you do this, you can also start to suggest form by dropping in some darker colors in the shadow areas. 4. Connect as many shapes as possible into one big wet area, and “separate” them by lifting and glazing small areas later. In the example above, I wet the bowl, the lemons and their shadows all at once and then let the colors bleed across the “edges” between objects. Even if you want to paint “realistic” color, this is a good idea. Often, beginners want to keep colors contained and not let the yellow lemons bleed into the blue bowl. But, in fact, the yellow of the lemons will be reflected into the blue of the bowl and vice versa. Letting the colors bleed by not making a dividing edge between them in the first wash will give the effect of reflected light, and make the objects appear to “live” in the same space in the finished painting. Notice how adding the shadow on the right lemon separates it from the lemon in the middle. This is nothing more than so-called “negative painting”, but I find many people find that term confusing, so I don’t often use it. Later, we can come back and “separate” the right lemon from the one in the middle of the painting by painting the shadow on the left side of the lemon on the right. This is nothing more than so-called “negative painting”. I tend not to use that term, because I feel that the term itself sometimes makes it hard for people to learn the technique. It’s easier to just think that you can define an edge, or part of the edge, of something by painting inside the edge or outside the edge. Here, we do both (inside the edge of the right lemon, and outside the edge of the middle lemon). 5. Whenever possible, draw with the brush. As I put in the shadow shapes on the lemons and the bowl, I challenged myself to use a single brushstroke (or maybe two, if the area was large), instead of drawing and “coloring in” the shadow. I tried to use a brushstroke (or two) to make the shadow shapes on the bowl and lemons. For the soft shadows on the lemons, I wet the paper first and then made my brushstrokes. In the foreground shadow, you can see where I swept a brush with clear water over the foreground and let it touch the edge of the shadow to soften it. Where the shadow shapes had soft edges, such as on the lemons, I wet the area first and then placed a brushstroke on the damp paper, letting the edges soften on their own. Much easier, and more natural-looking, than painting “a shadow” shape and trying to quickly soften the edges. To keep my stress level down, I always have a scrap piece of paper on my work table for practicing brushstrokes and testing colors BEFORE I try them out on the actual painting! 6. Touch a wet edge in a few places as you lay in an adjacent wash and let the color run. For the cast shadows on the table, I ran a brush with clear water over the light area of the table top, and let the wet brush touch the shadow shapes in a few places to give the effect of the shadow softening as it moved away from the object casting it. 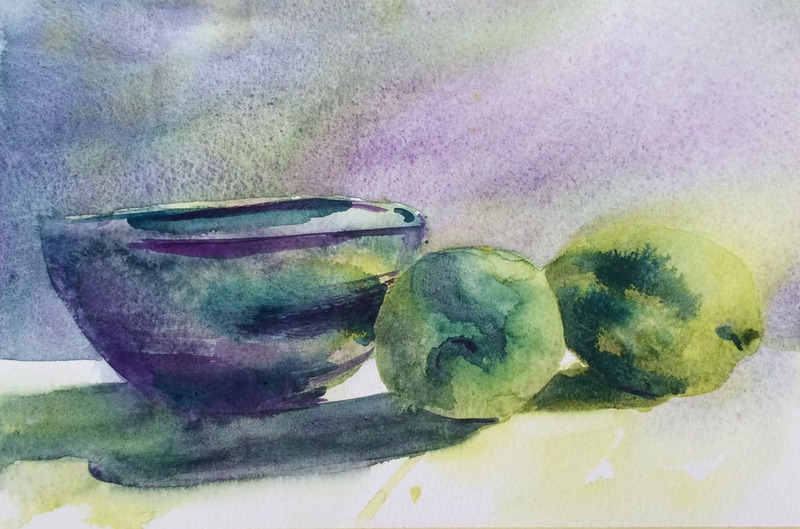 As I laid in the color on the wall behind the bowl and lemons, I let my brush wander over the edge of the still-damp bowl and lemons here and there. By the way, I wish I hadn’t added any color to the wall behind the bowl and lemons—I much preferred the splashy underpainting! I let myself be persuaded by feeling I should stick closer to the value plan I started with. This is a perfect example of a time when I wish I had abandoned my original plan when the watercolor gave me something better. This is why I try to pause frequently to reassess and ask myself if I want to change my plan now that I see what’s happened. I let myself get rushed here and didn’t take that time. 7. Use a spray bottle to soften and make color run, especially around the edges. I laid in darker color than I liked on the right side in the background, so I held the paper up sideways and sprayed the lemon and background on the right, letting the excess color run off the page. I like how that brings the viewer’s attention more to the bowl on the left side, which I think is a more interesting area (in this draft, anyway). I used a spray bottle to soften and allow the color to run on the right side of the “background”. I like how the yellow color of the lemon ran and softened, giving it some atmosphere and bringing the viewer’s attention more to the crisper edges in the bowl.